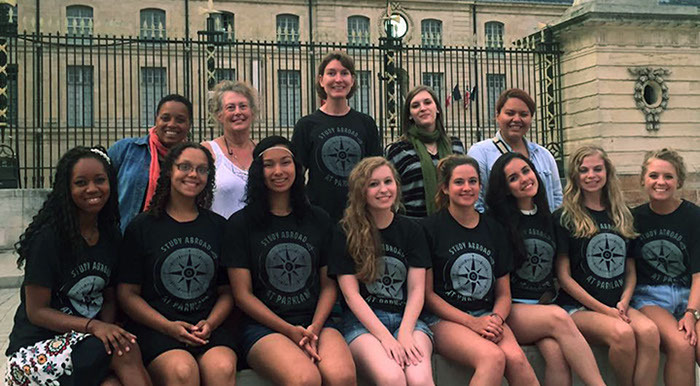 This four week program is open to anyone—student, faculty, or community member—who is interested in experiencing life in another culture while learning French language and culture in an immersion setting. Dijon, France, located at the crossroads of Europe, is a lively, progressive university city of over 250,000 inhabitants. Capitol of gastronomy and gateway to the prestigious vineyards of Burgundy, Dijon is exceptionally rich in history and art. Heir to the splendors of the glorious court of the Dukes of Burgundy, Dijon boasts numerous monuments, museums, and architectural jewels including churches, cathedrals, and private residences dating from the Middle Ages. Located in the heart of the University of Burgundy campus, the Centre Internationale d’Études Françaises was founded in 1902 and each year welcomes students from all over the world. Students receive a minimum of 20 hours per week of instruction from native speaker faculty members who specialize in the communicative teaching of French as a foreign language. In addition to studying French, students will take HUM 124: Humanities Field Experience. This online course develops an appreciation of a France’s culture through a greater understanding art, music, literature, philosophy, geography, history and other cultural aspects. Weekends in Paris and Provence are required part of the Humanities course. Grades will be transcribed by the student’s home institution. Students who attend colleges that are not members of the Illinois Consortium for International Studies and Programs (ICISP) are advised to clear all courses with their home schools before applying for the program and to work closely with the Dijon Program Director at Parkland College. Students will earn up to 7 transferable credits. Travel is an important part of the program and is provided to broaden the students’ experience. A three- day Paris visit—complete with a guided orientation tour, group welcome dinner, museum entrances, and an evening Seine River cruise–is planned before heading by private coach or fast train (depending on group size) to your final destination and ―home‖ for the next four weeks, Dijon. Also included on one of the weekends of the program is a three-day tour of Provence, including the Roman cities of Arles and Orange, the Popes’ Palace in Avignon, the Pont du Gard, Les Baux de Provence, the Camargue and the Mediterranean coast! While in Dijon students will visit local art and history museums, visit neighboring towns, tour wineries, and much more. Participants will reside in the University of Burgundy’s Résidence Internationale d’Étudiants (international student residence hall) in private rooms with full baths. In addition to a single bed, desk, closet, and plenty of shelving, each clean, modern, comfortable room has a small refrigerator. Kitchens located close to all rooms provide cooking facilities for those who want to prepare their own meals. Bedding is provided, but not towels. Meals are not included in the program costs. However, substantial and tasty lunches can be purchased at very low cost (approx. $4) with the CIEF student ID card at the conveniently-located campus cafeterias. College students must provide proof of a 2.75 GPA as well as having completed 12 credit hours of college level work, including Composition/English 101 or equivalent. All applicants will be required to complete a personal interview to determine seriousness and ability to benefit from the program. Applicants should be aware that this program includes walking up to 5 miles daily and regularly using stairs. All individuals who have been accepted to participate will be subsequently required to complete a physical. • Paris trip: Transfer from Paris airport to city center, two nights lodging with breakfast included, welcome dinner, guided walking tour, museum entrances and high speed train from Paris to Dijon. • Provence trip: private bus with tour guide, two nights lodging with one group dinner and two breakfasts, and all museum entrances. Additional tuition charges may apply. Some types of financial aid are applicable to study abroad, and scholarship money may be available through your home institution. For information about eligibility, additional tuition charges, and financial aid (including scholarships), please contact the ICISP representative and/or the Office of Financial Aid at your institution. To apply, please contact the ICISP representative at your home institution for an application.